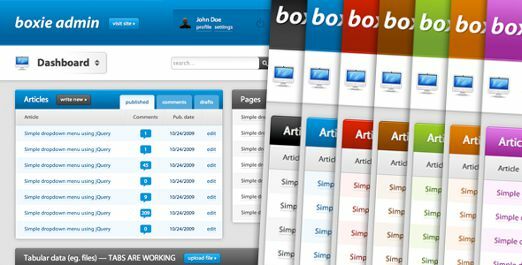 The most sold ‘Admin Template’ from Themeforest, Simpla Admin is a professional template with a beautiful and user friendly interface. With various smart and intuitive jQuery functions, navigating the interface is a breeze. It utilizes very few plugin scripts (most functions are hand coded) so the code is very lightweight and easy to manage/modify. 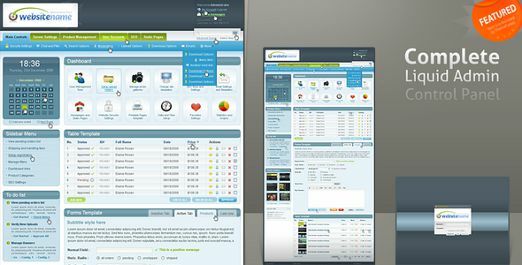 Complete Liquid Admin Control Panel is a complex Liquid admin template that contains a login page as well as a modular content page that includes all the elements you could possible need in your Admin Panel. You’re able to generate any required page from these elements. Liquid as oposed to a fixed size means all the screen real-estate is used in the most efficient manner possible and also eliminates compatibility issues with non-standard, very low or very high screen resolutions. 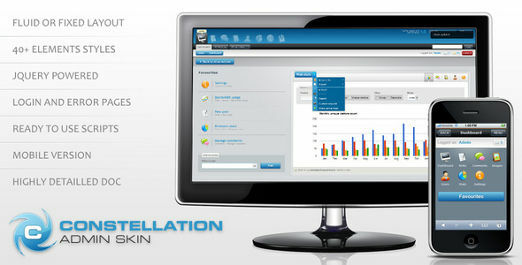 Constellation is a powerful admin skin with fixed/fluid layout for building advanced backends, both for desktop and mobile users. Powered by jQuery for maximum user experience, it provides a wide range of styles from data visualization to lists and calendars, all fluid and nestable. Flexible to house any kind of application, Admintasia is a complete backend administration user interface that loads last, it’s intuitive and easy to use, it uses only three small images and it also looks good. Having a customizable layout, you can divide the main content area into one big box and two small ones, or three smaller one, or two big ones. 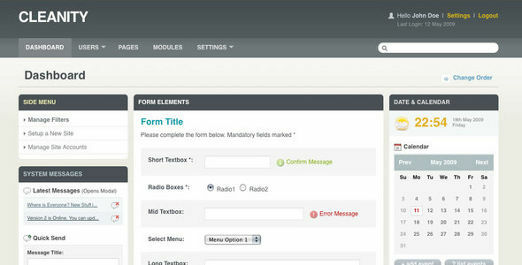 The premium version of Admintasia includes sliders, flexigrids, accordions, modal video, and many other nice features. Having a modern looking design, easy to use user interface (UI) and cool user experience (UX), this simple and stylish administration template has clean & professional code using the latest web standards optimized for fast loading, accessibility, semantics and so on. The well commented code allows you to understand and modify your Boxie Admin as you’ll want. 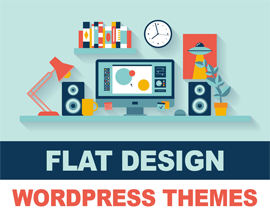 The template comes with 7 color variants: Blue, Black, Red, Brown, Green, Orange and Purple. 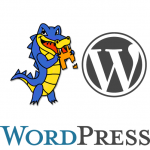 Inspired by the WordPress Administration layout. Cleanity is a professional looking and highly flourished skin, suitable for almost any kind purpose. 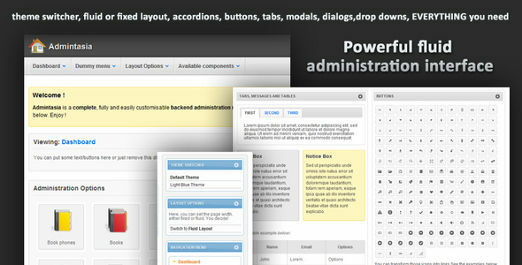 It’s a compilation of all features you might need on an administration theme. Wide Admin is an easy skinnable 101% customizable powerful backend interface with wide aspect and 2 skins (Smooth gray, and silk black). Comes with a complete documentation and full support. Administry is a fully jQuery Powered – HTML5 + CSS3 compliant – Control Panel template, best for content management systems, website backends or as a standalone skin for a web application. 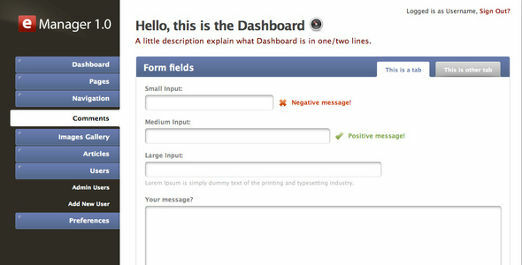 The template includes 4 sample pages: “Login page”, “Dashboard”, “File management” and “Product management”. 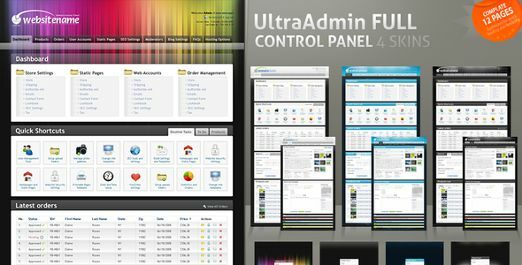 UltraAdmin is an advanced cross-browser compatible, very stylish, yet easy to use administration panel template. It includes 4 color schemes (skins): the very hot aurora graphic skin, white, blue and dark skins. The control panel is divided in a login page and two content pages that includes all the the elements you could possibly need in your admin. Using these elements you can generate any required page. Having a clean CSS coding, changing the color scheme is a simple matter of editing the stylesheet the HTML page loads. The template includes all page .psd files as well as slices and should be easy to customise with medium knowledge of Photoshop and CSS . 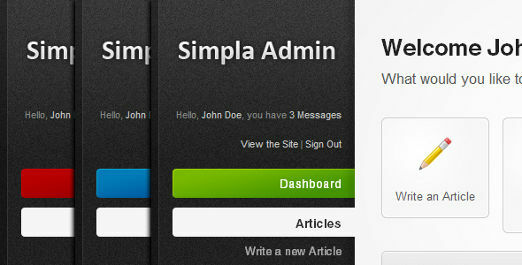 eManager 1.0 is a simple CMS skin with a nice and clean user interface. It includes the basic things you need to build your application including forms, alerts, menu, submenu, lists, icons and tabs. The elements can be arranged as you like. Comes with a fixed layout, clean code and documentation. Looking for something cheaper and simpler? 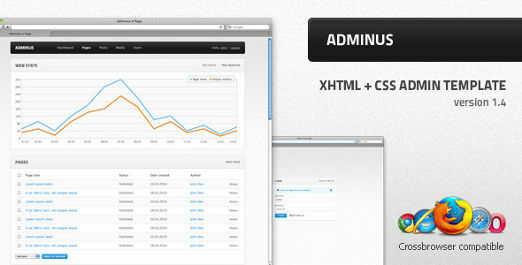 Checkout this list of Admin Skins from Themeforest. 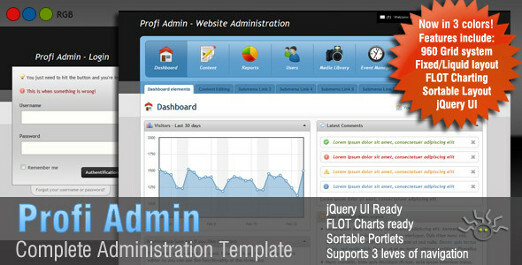 I was searching for admin panel design idea from long time, thanks for sharing this now i can make my client happy ?? This was the first time I’ve read something about Admin Panel Skins and to be honest I am amazed with the details.